Most museums are planning special events and exhibits in conjunction with Art Miami and Art Basel. Art Miami launches its First View VIP Preview at 1 Herald Plaza Dec. 4-9. Art Basel starts later that week in Miami Beach, from Dec. 6-9. Exhibits and events are happening off the grid in a variety of museums across Miami-Dade County. 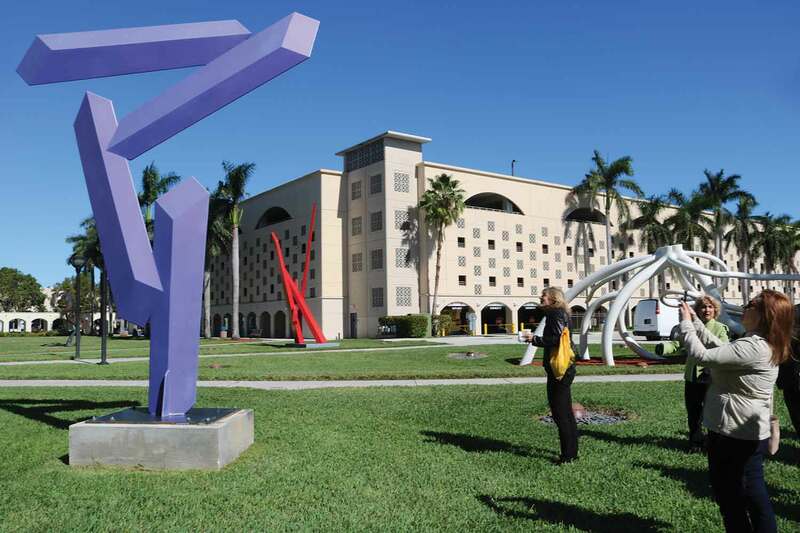 One museum close to the action is Florida International University’s Jewish Museum of Florida at 301 Washington Ave.
Susan Gladstone, the executive director of the museum, hopes the Dec. 9 morning event at the location the annual Basel, Lox and Cream Cheese draws in large numbers. She expects Daniel Chimowit’s Walking Canvases to draw in a large Instagram crowd since she already sees a younger demographic flooding through the doors. A venue across from the Art Miami location, the Pérez Art Museum Miami at 1103 Biscayne Blvd., has a lineup of two new exhibits, a speaking engagement sure to draw large crowds, and a party. The museum will open Portuguese artist’s Pedro Neves Marques’s AMordida, imagining the relationship between mosquitos and sexuality through bio-fiction, along with a kinetic light show highlighting current political issues, American Echo Chamber by Peruvian artist José Carlos Martinant. Artist Christo Vladmirov Javacheff will be making an appearance Dec. 4. He and his wife Jeanne-Claude are the masterminds behind the 1980s project Surrounded Islands, during which the duo covered many smaller islands on Biscayne Bay with bright pink fabric. A lot of thought goes into preparing for Art Miami and Art Basel, says Mr. Ostrander. His team has selected exhibits, such as by Jamaican artist Ebony G. Patterson, that focus on local and national discussion touching upon politics and race for international audiences. Chana Budgazad is planning for Art Basel crowds for the first time at Museum of Contemporary Art as its new executive director. She said she believes upcoming African Commune of Bad Relevant Artists, or AfriCOBRA, exhibit will bring in outsiders and locals alike. The museum celebrates the 50th anniversary of the Chicago-based collective. Seven of the 10 artists that contributed aesthetics and visuals of the black arts movement in the 1960s will be attending the opening celebrating Dec. 6 at 770 NE 125th St.
HistoryMiami Museum Marketing Director Michele Reese said she expects over 1,000 visitors over the span of four days. Her museum, like other institutions, is taking advantage of the visitor numbers. HistoryMiami at 101 W Flagler St. will host street photography collected from its three competitions – International Photo Series, Miami Photo Series, and the Miami Street Photo Competition. Photographers’ submission fees, ranging from $20 to $75, pay the bill for activities spanning four days, including flying in and hosting master class speakers. Another venue organizing events is the Lowe Art Museum at 1301 Stanford Dr. Director and Chief Curator Jill Deupi is offering Baseling with the Lowe, different scheduled events throughout the week including after-hours showings and free guided tours. She expects over 300 guests for the Lowe After Hours on Dec. 6 as well as Bubbles and Brunch on Dec. 9 hosting Hank Willis Thomas for the Arnold and Augusta Newman Lecture Series. Visitors to the Patricia & Phillip Frost Art Museum at Florida International University can gaze at exhibits Writing on the Wall by Hank Willis Thomas and Dr. Baz Dreisinger as well as Relational Undercurrents, representing artists from all over the Caribbean. The museum’s signature event, Breakfast in the Park, is held the last day of citywide festivities, Dec. 9. She hopes the majority will be locals who revisit the event or attend for the first time and look forward to their return.